We’re gathering on the traditional territory of the Mississaugas of the New Credit." In March, 2013, Ontario Power Generation (OPG) announced, "Ontario’s new Niagara Tunnel is producing more clean, renewable, low-cost electricity at the Sir Adam Beck generating complex." The project had seen delays and early budget overruns which pushed the project cost up to $1.5 billion. The payoff for the work was to be "about 1.6 billion kilowatt-hours." OPG announced the project complete and in service in March 2013. The growth in annual (12-month) production was ~600million kilowatt-hours, or 0.6 terawatt-hours (TWh). While this is less than 40% of the promised 1.6TWh, it is still presents far too favourable a picture of what happened after the tunnel entered service. 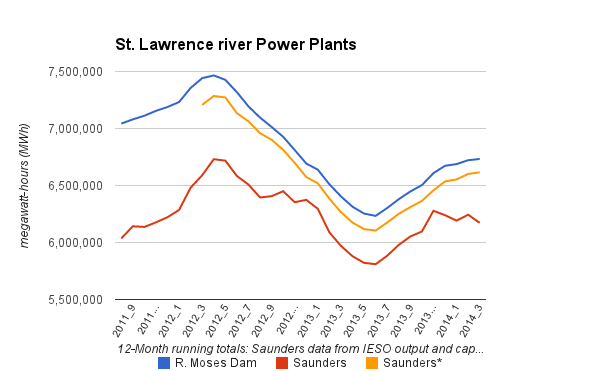 Hydroelectric production is cyclical, and higher water levels throughout Ontario increased hydro production 14+% while the output at Beck was up only 5%. A fairer comparison for Beck might be the U.S. Robert Moses Niagara facility, which shares Niagara river water rights under an agreement between the countries. The new tunnel will not change that amount [of total hdyro generation], because the U.S. has been drawing off whatever amount of water Canada could not handle, up to the treaty limit. The U.S. used the water to generate power, and then sent half of it back to Canada..."
I could not confirm this account, but the subsequent data seems supportive; higher water levels in 2012 boosted US supply, but not Ontario's. 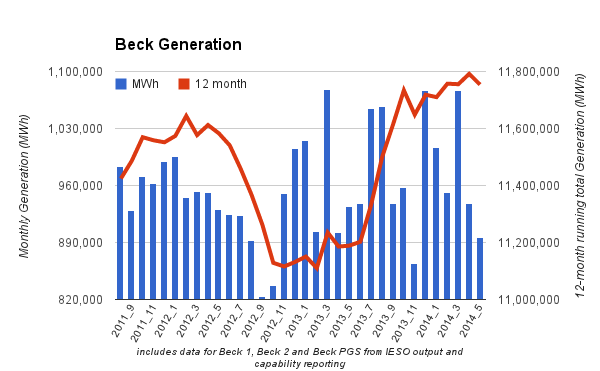 Between March 2013 and March 2014 (the first 12-months after OPG reported the tunnel complete) the Canadian Beck generators increased annual production by 0.52 TWh, not considerably more than a .436TWh increase at the American generator. 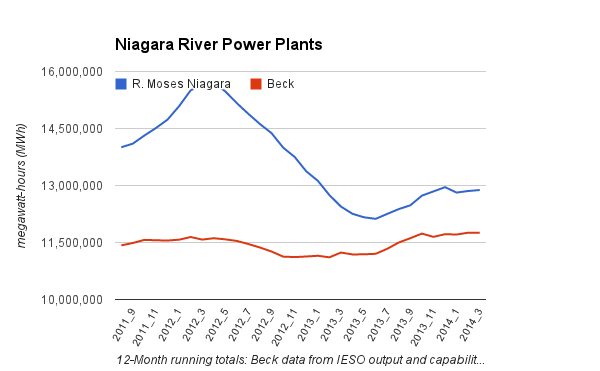 It does not look as though the inability to get water to Beck's production turbines was the main impediment to increased generation from the Niagara river. It looks like transmission is. By 2006 the project was curtailed by events in the Caledonia area - specifically the seizing and destroying of hydro towers by the Six Nations community. By 2008 the system operator was describing the transmission line project as "delayed indefinitely." That was always going to be a lie, but the fullness of the lie is now, in 2014, evident. Unfortunately, in Ontario's largest urban centres, easy lies garner easy votes. In 2013 OPG received 4 cents per kilowatt-hour (kWh), making an anticipated value of the tunnel's anticipated 1.6 billion kWh $64 million. The Ontario Power Authority (OPA) forecasts spending of $838 million, in 2014, on about the same amount of electricity contracted from solar panels - all of it production contracted since the tunnel/transmission project was launched. The disregard of engineers, trades persons, and other electricity sector professionals is exacerbated by the fact that the "Six Nations" is reportedly incorporated into 9 renewable energy projects - because the feed-in tariff programs pays more to projects with aboriginal participation. The same people preventing affordable energy from flowing have schemed to make unaffordable energy even more expensive. The Ontario Energy Board is currently ruling on OPG's proposed rate hikes, a large portion of which is to cover the cost of a tunnel that isn't capable of producing the expected output. They should turn it down. OPG should sue Hydro One. Hydro One should sue the police. Or...The Premier of Toronto could attempt to be the Premier of Ontario by speaking in Caledonia and finding a speedy resolution. 2. The level of Lake Ontario is controlled by dams, with generating stations, on the St. Lawrence river. As with Niagara, there is a Canadian plant (Saunders), and an American plant (Robert Moses Power Dam). I've collected information on both the reported output of Saunders, and generation from the plant that is not reported, but apparently fed directly into Quebec's high voltage direct current (HVDC) grid. The Saunders plant runs steadily, and could be referred to as baseload. This looks to be the case on the American side too. 3. The wikipedia snapshot of the regions history is found in the Haldimand Proclamation page's "The land was acquired from the Mississaugas in May 1784"